Come to the exhibit on Memorial Day weekend . As you study everything it has to offer you, become enlightened on how personal perceptions are influenced by visual imagery alone. The more patrons who arrive, the more chances we have of tackling the problem. Help treat it as a science by participating and observing what both your eyes and brain seem to be showing and telling you, only to be pleasantly shocked by more than 99 FACES of stories that are so much different than you every could imagine! 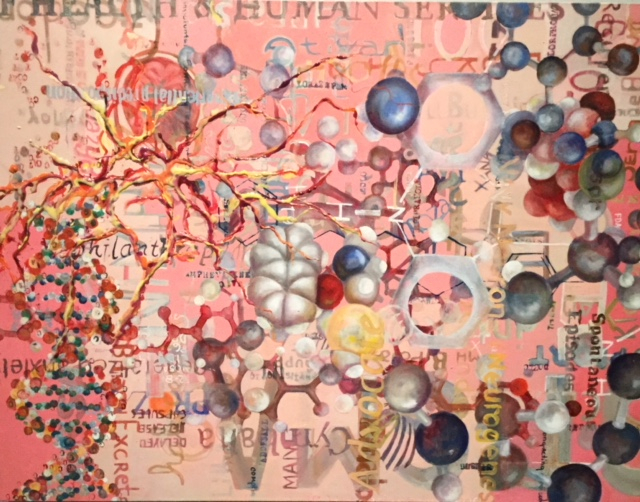 Cutrell's exhibit is part of Stigma Unstuck: A Mental Health Arts Series at Tufts. This multi-event art and film series is aimed at enhancing awareness and understanding of mental health issues to facilitate shifts in attitudes that perpetuate stigma and discrimination. Stigma Unstuck is being coordinated by the Department of Community Health at Tufts and the Community Health Improvement Department at the Cambridge Health Alliance. An opening reception for the exhibit and the Stigma Unstuck initiative will take place at CLIC from 5 to 7:30 p.m. on Thursday, Jan. 24, 2019. Tufts has identified mental health and stress as important public health problems, as evidenced by the 2016 launch of the Mental Health Task Force. As Jennifer Allen, professor and chair of the Department of Community Health, points out, rates of depression, anxiety, and suicidal thoughts are soaring among college students nationwide. She believes art can be part of the solution. "It's been a dream of mine to bring students into difficult conversations through the arts," Allen said. " "It's a new approach," Cutrell said. "We have champions in every walk of life — amputees who have thrived despite their challenges, people with ALS who are champions of inspiration, people with cancer who are surviving and fighting. Although hidden, there are plenty of champions in the area of mental health, too, but the concept hasn't quite been revealed due to stigma. This exhibit opens that view of mental health champions." Cutrell teamed with Bruce Cohen, M.D., Ph.D., a neuroscientist and former president of McLean Hospital, and Rae Simpson, Ph.D., a science journalist, to create The Many Faces of Our Mental Health. Her goal is to both educate visitors about mental illness from a scientific perspective and provide inspiration by highlighting people who have had success in dealing with the challenges of mental illness. Cutrell's exhibit includes portraits of 99 individuals, with equal representation from three groups: people living with symptoms of schizophrenia, people living with symptoms of bipolar disorder, and the people who love them. The subjects are mixed together without any labels as to who has what symptoms, which makes the overall piece more relatable. The racial breakdown of the 99 people mirrors that of the 2010 U.S. Census. There is also diversity in terms of walks of life — among those photographed are people who have been homeless, a billionaire, a Massachusetts Supreme Court justice, six Ph.D.'s, several MBAs, and 22 veterans. All of this is intentional, as Cutrell wants every viewer to be able to identify with the faces they see. A sculpture depicting the DNA strand in someone with mental illness symptoms is one of the most striking pieces in the exhibit. Cutrell incorporated four miles of fiber (representing the genes) to make it to scale, along with pearls and sequins (the proteins, histones, and amino acids) placed strategically on the twisted fibers. Twenty-five people, all of whom had had symptoms of schizophrenia or bipolar illness, helped assemble the work over a six-month period. "I decided I'd break it open a bit, delve into the science, and use art as opposed to lectures or things like that to invoke some discussion," Cutrell said. "People can look at this piece and say, 'Mental illness can impact different people in different ways.' 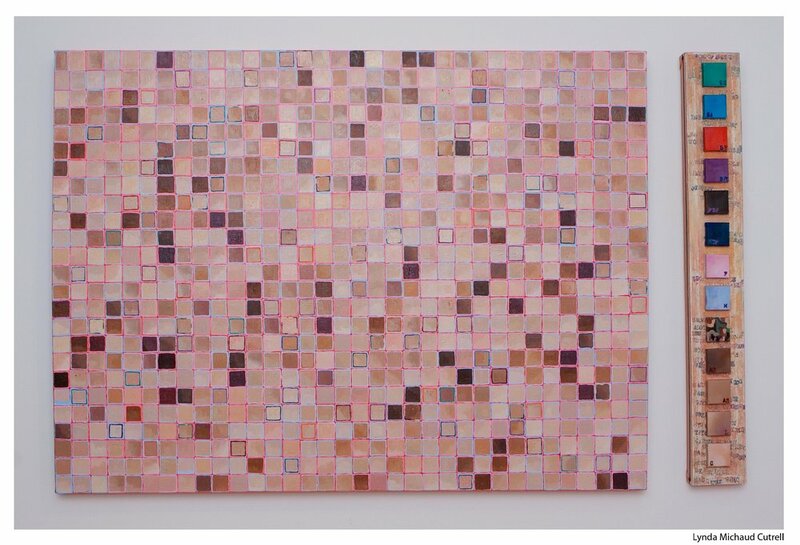 That's something I learned at SMFA — if you leave it open, people will figure out their own relationship to the piece. For someone in science, it might be all about the genetics. Someone who's into art may be wondering, 'What's that sculpture made of?' or 'How did you do that?'" A trio of paintings featured in the exhibit has an interesting back story. In order to better understand her family member's illness, Cutrell met with neuroscientists at McLean Hospital who were studying it. They shared with her a dense research paper that took her three months to fully digest. 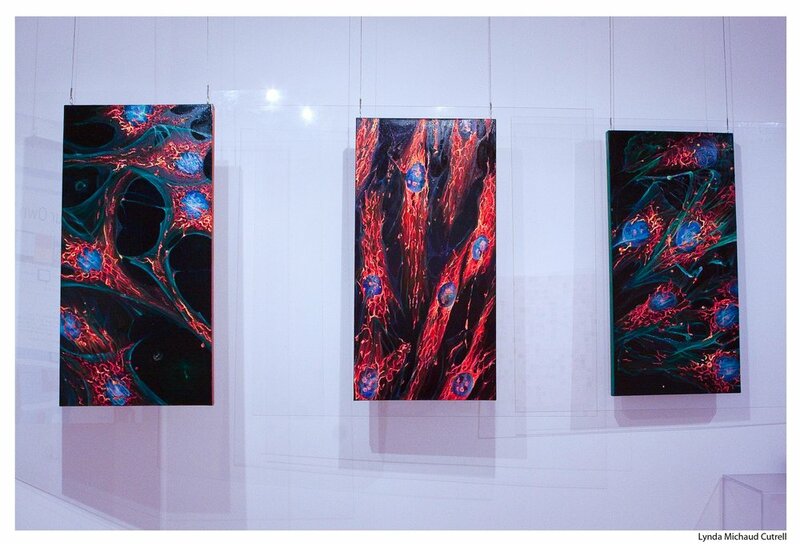 Cutrell translated what she learned into three paintings contrasting skin cells in people with schizophrenia, with bipolar illness, and those without any symptoms. "Art makes the paper accessible," she said. "I'm showing that mental illness isn't just behavioral thing, but rather is a systemic condition. It's not something that's caused by a family member; it's truly a biological symptom. Outside of her artwork, Cutrell has been a long-time advocate for people struggling with mental illness. She served on the National Alliance on Mental Illness (NAMI) Massachusetts board of directors for five years, including several as board president, and on the national NAMI board of directors. In addition, Cutrell has been active in Massachusetts and nationally in pushing for training to teach police officers how to handle a crisis involving someone experiencing symptoms of mental illness. "If police officers and other first responders can appreciate how common this is and how to best deal with people in a mental health crisis, we'll have more success and fewer violent incidents," she said. In 2018 The Many Faces of Our Mental Health had runs at Boston's Museum of Science as well as Salem State University and Gordon College. The next stop after Tufts is the Dartmouth-Hitchcock Medical Center, part of a health care system that trains nearly 400 medical residents and fellows a year and performs world-class psychiatric research. Cutrell believes she can make the biggest impact by educating young people on how to get treatment for mental illness and how to support their friends who are struggling. "The biggest obstacle to treatment is self-stigma," she said. "People are less likely to reach out to get treatment because they're afraid; they think it's equivalent to some kind of worthlessness. This exhibit shows people who are likable, functional, and valued regardless of symptoms."